MercyMe founder and lead singer Bart Millard, director of GCU’s Center for Worship Arts, greets students in the University’s new degree program before Saturday’s Switchfoot concert in GCU Arena. The remarkable transformation of Grand Canyon University from small, sleepy campus to booming university was right there for all to see — and hear — Saturday night. But this wasn’t just a coming-out party for GCU Arena 2.0. This was more about the new generation of GCU. 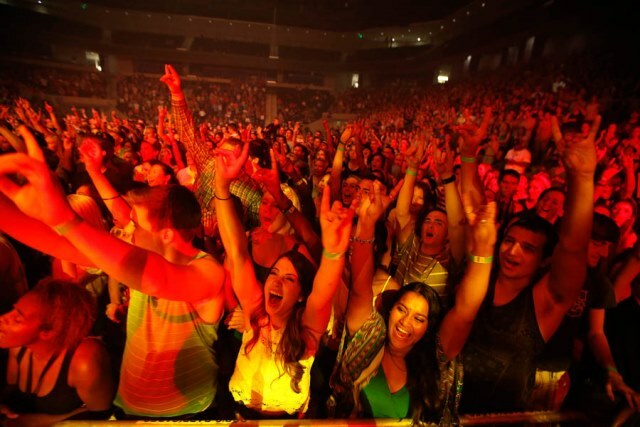 The University’s newly expanded Arena got its first test run with a free concert that included the Chapel band and an up-and-coming group called All Things New that traveled all the way from Orlando, Fla., just to play at GCU. The featured act was Switchfoot, a big-time alternative rock group from San Diego that had the crowd swaying and dancing. It was a busy night on campus. While 2,000 people crowded outside the doors of the Arena one hour before the start of the concert, a full house at Antelope Gym watched the women’s volleyball alumni game. GCU students smile and sway on Saturday evening during the Arena’s first event since its expansion. And by the time the concert started, the crowd estimated at 3,800, including a mosh pit that filled almost half the floor area. The new upper deck went unused save for a handful of people who wanted to try it out, but this was a night for students and staff to get a look at what GCU has become more than how the Arena has evolved. Previously, the culmination of Move-In Week was convocation, a fairly short, semi-formal event that was like a mini-preview of commencement. University executives and faculty gathered on stage, and after a few speeches it was time for students to say goodbye to their parents and get on with the University experience. The true game-changer, though, is GCU’s ever increasing size. Going from 8,200 to nearly 11,000 students in one year does that. 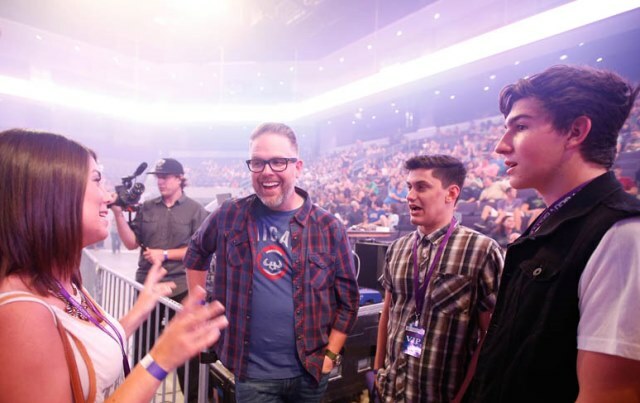 There was no better demonstration of this new age of engaging students than the scene when Bart Millard, director of the University’s new Center for Worship Arts, walked up to talk with Griffin at the north end of the Arena floor. Within minutes, a crowd of students surrounded Millard to shake his hand and get a picture (including several selfies) with him. They kept coming in waves for the better part of an hour in a scene not unlike an impromptu gathering when any celebrity — which Millard is through his work as founder and lead singer for MercyMe — is suddenly accessible to the masses. Millard said he has been “blown away” by what he has seen every time he has visited GCU in recent months since taking on his new role. Returning students gazing at the new upper deck no doubt had a similar reaction to how well the extra level meshes with the Arena as a whole. Judging from the reaction to the concert, this meshed well with the new GCU. It’s all part of growing up.